Our powerful, 100% Canadian plans are engineered to provide speed, flexibility and security to WordPress websites. Perfect for simple websites & blogs. Built for small business users & freelancers. Ideal for agencies, designers & developers. Our experienced hosting administrators ensure that your WordPress website is kept up-to-date and protected from evolving threats by proactively updating new versions of WordPress, plugins, security patches and more. 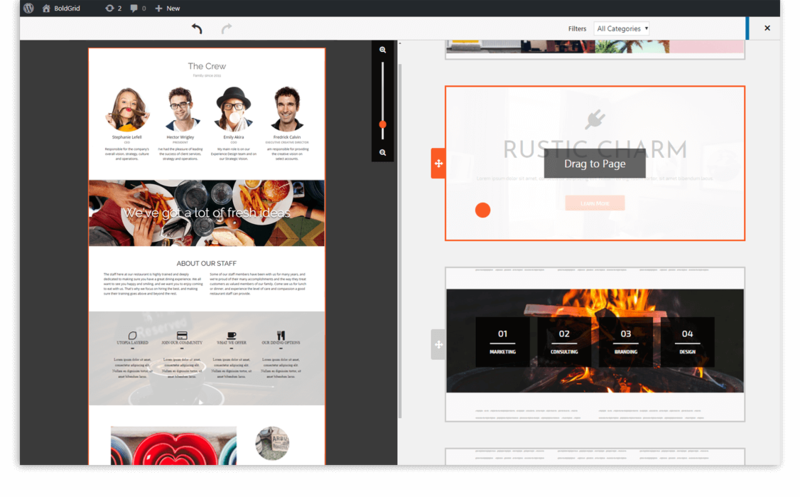 Design beautiful WordPress websites easily with BoldGrid* drag-and-drop website builder. Choose from hundreds of themes and page templates. Get straight to work with pre-installed WordPress, then efficiently build websites, test new features, manage applications, and keep everything secure with the powerful Plesk WordPress Toolkit. Remain secure from cyber threats with proactive threat monitoring, DDoS protection, malware removal and automatic patching. Have the utmost confidence in your website’s availability. We guarantee 99.9% uptime and feature Litespeed webservers optimized to deliver WordPress websites fat. Rest easy knowing you’re hosted on 100% Canadian servers, backed by WordPress savvy, responsive customer support who can help you in English or French. Leverage the most complete and versatile toolkit available for building, securing and managing WordPress websites. Available with our Pro and Advanced plans, our WordPress web hosting toolkit helps web designers, developers and agencies grow by allowing them to work smarter, faster and more securely. 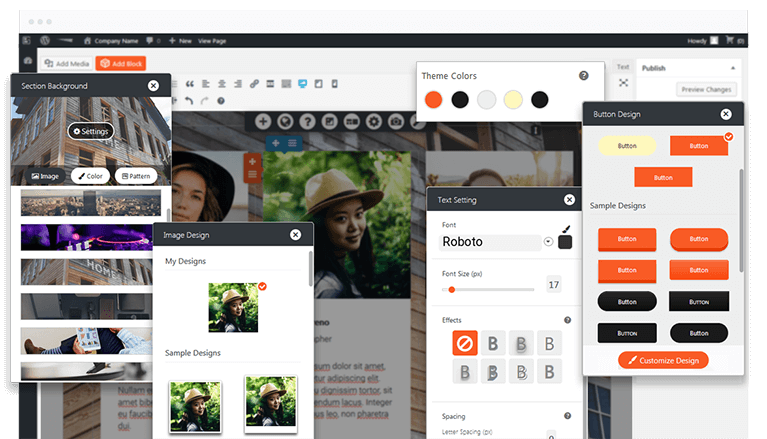 BoldGrid is a drag and drop plugin suite for WordPress that makes designing high quality WordPress websites easy - no coding or design skill required. Harness the world’s most popular content management system, without the learning curve and bring your idea to life. Value is about more than sticker price. At Webnames, we pride ourselves in developing outstanding products, and back them with up with expert customer support. If you don't understand something, we will explain it. If there is a problem, we will resolve it. We are your ally on the web. Feature rich email hosted on separate, optimized mail servers (full details below). Every WordPress hosting plan includes an unlimited amount of data transfer per month. Every WordPress hosting plan includes an unlimited amount of file storage. More than just an intuitive control panel, award-winning Plesk Onyx allows you to powerfully and securely manage your website, applications and email. Our servers, databases and offices are all located north of the 49th parallel. This ensures your data is protected by Canada’s strong privacy laws. When it’s time to start a new website, install and initialize everything you need in just a single click. Easily install WooCommerce, Google Analytics, Akisment, Jetpack, Yoast, Contact Form 7, WPForms, and thousands more. Synchronize changes and data across two distinct WordPress instances. Test new features, changes and ideas in a staging environment before rolling out to a live website. Expedite future work by cloning a previous site instead of starting from scratch. Quickly find and install a plugin or theme on a WordPress instance or several instances at once. 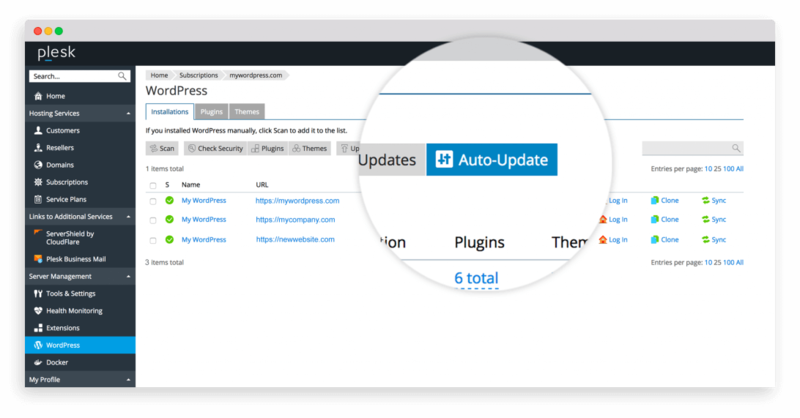 Choose to update your WordPress themes and plugins automatically when new versions become available. Set-up automatic backups to ensure all your work is saved and accessible. Rollback your website back to its previous state if something goes wrong with your latest deployment. Manage all debug options cohesively, or on an instance by instance basis. Enable or disable search engine indexing on each WordPress instance. Easily move external WordPress instances to your hosting plan. Every WordPress website hosted at Webnames is regularly scanned to block malicious activity, preventing malware, exploits and attacks before they occur. LiteSpeed is the world's leading web server acceleration solution. It measurably reduces server response time and increases capacity to ensure that your WordPress website is lightning fast. Our WordPress hosting utilizes high-performance SSD drives for file and database storage for exceptionally fat load times. Our powerful DDoS protection safeguards your applications and networks against both known and evolving network security threats. Imunify360 is the most powerful server security solution available. It proactively protects servers and websites from emerging security threats, new attacks and unknown malware. Patchman comprehensively scans web applications for out-dated applications, malware scripts, and other vulnerabilities, fixing them behind the scenes to proactively protect your website. Email that matches your domain is a powerful branding tool. Manage your email with our intuitive webmail interface, your favourite client, or third-party services like Gmail. Webnames email is hosted on separate servers for optimal security and uptime. Our email servers are optimized to protect your email from spam, blacklisting and more. Webnames email comes with robust firewalls, real-time spam filtering and at-the-source virus protection to eradicate junk mail from your inbox, keeping your safe and saving you time. Webnames has a reputation for exceptional, highly responsive customer service, and happy customers. Every member of our in-house customer support team is a highly trained technician capable of providing expert hosting support. If you’re moving from another webhost, our hosting experts will manage the migration of your WordPress website to our hosting platform for free. Learn more. If you need extra help updating, managing or optimizing your WordPress website, our team of WordPress experts are available to provide on-demand support. Learn more. Move your WordPress website to Webnames hosting today! Our technicians will move you over, set you up, and ensure everything is running smoothly. "I’ve called to get WordPress help on several occasions and each time I have received extremely patient, helpful, one-on-one assistance...even on a stat holiday! I can’t say enough good things about this company." WordPress is a free, open-sourced Content Management System (CMS), and is the #1 website hosting platform in the world. Approximately 30% of all websites on the internet are built using WordPress. What is WordPress optimized hosting? WordPress optimized hosting is a specialized type of hosting that has additional features and configurations in place to boost the performance, features, and security of WordPress websites. Why purchase WordPress hosting from Webnames.ca? Webnames has been providing hosting for WordPress websites for more than 15 years. Our systems have been continually refined and updated to provide the best possible environment for WordPress. Our staff are well versed on WordPress and can assist with issues if they come up. For larger tasks and projects, we offer in-house WordPress Support Plans. 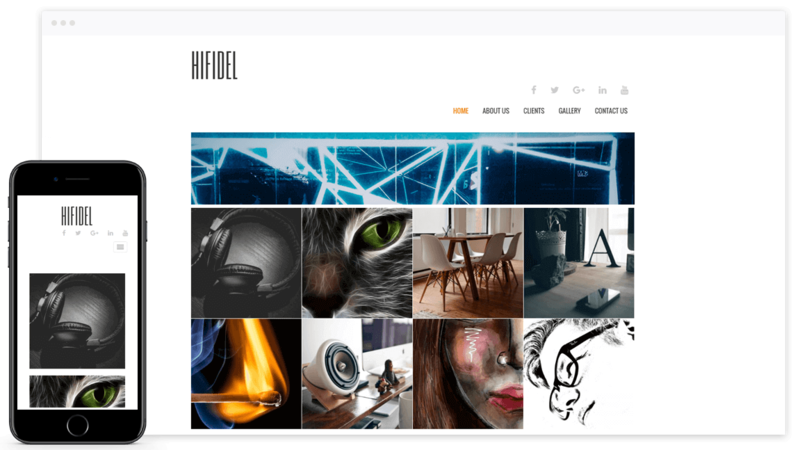 Get everything you need for your website all from one place! What does one-click mean exactly? The one-click installation of apps and features means that the setup process of these app has been simplified and automated down to as few steps as possible, and can be done from a single place within your account. What are the benefits of hosting a website in Canada? Location location location. If your primary audience is within Canada, then it makes sense to host your website in Canada as well. Doing so has website speed benefits, since the data transmission between your website and visitors has fewer networks to traverse than if your website were to be hosted in a different country than your visitors. For customers who have concerns about the privacy of their data, data hosted in Canada are subject to the data privacy laws of Canada, whereas when websites are hosted in other countries, then the related data is subject to the laws of the country where the hosting is provided. How does BoldGrid compare to website builders like Wix, Weebly and Squarespace? Websites built with BoldGrid and powered by WordPress have several benefits over other website builders such as Wix, Weebly and Squarespace. Wix, Weebly, Squarespace and many other website platforms are proprietary property of their respective companies. Websites built using these platforms are not compatible with any other website hosting, and therefore must always be hosted by the respective company. Regardless of future pricing, performance or preference, these websites cannot be moved to any other hosting provider. WordPress, on the other hand, is a free and open-source platform. Websites built using Wordpress can be freely moved between any hosting provider. Additionally, WordPress is constantly evolving with new editions and features. Websites built using WordPress can take advantage of all current features and future improvements for free, forever. Wix, Weebly and Squarespace are commercial, closed and proprietary platforms. WordPress is free, extensible, and future-proof – forever. Is this the premium version of BoldGrid? What are the differences between the Premium and Free plugin bundles? The BoldGrid included with Webnames WordPress hosting plans is the premium version and includes a BoldGrid Premium Connect Key. This means all BoldGrid features will be enabled without limitation. Webnames customers can receive customer support directly from our in-house team, in addition to the team that created BoldGrid. The free, non-hosted version BoldGrid does not include certain premium features or customer support. Websites built using the free version will also contain BoldGrid branding and links back to the BoldGrid website. What does “Managed” WordPress Hosting mean? All our WordPress hosting plans include one premium BoldGrid license. BoldGrid works as a suite of plugins for WordPress, adding an easy to use drag and drop website builder experience to the already powerful application. It features powerful design tools. BoldGrid is optional to use and free with all our WordPress hosting plans.